If you read my previous post, or saw my numerous photos on Instagram, you'd know I was in New York City for a few days! I was there touring a few different colleges, so our trip was pretty jam-packed. So jam-packed that we didn't even step foot in a clothing store. Let me reiterate, we did absolutely ZERO shopping during our time there. If you know me and my mom, that is very strange. I'm still confused about it. Nonetheless, a trip to NY is always a fab time, especially because of all of the hip, ambient-rich restaurants and corner cafes. Each time I visit, I always make sure to try out a new place to eat. This time around, I think I found a new favorite. Check out the photos below featuring all the fun restaurants we went to and things we did! This particular cute little cafe is located right across the street from Bryant Park on W 40th street, however they have over 10 locations scattered throughout the city; so finding one wherever you may be while visiting the Big Apple shouldn't be an issue! From the diverse, fresh, and dietary-needs-friendly menu, to the rustic decor, this is most definitely the place to meet for brunch with friends or to snag a quick breakfast from the grab & go section before work! P.S. They have unbelievably tempting bakery items, so do yourself a favor and order a pastry. You won't regret it! Like I said, trying out new places to eat is one of my favorite things to do in NYC. So usually, before I head up there, I do a little research and make a list of a few of the restaurants I want to visit. By Chloe was at the top of my list. This little Vegan gem is always busy, and for good reason. On their website it says that they aim to make plant-based, energy rich foods without compromising taste and flavor and let me tell you, they nailed it! I ordered the Guac Burger and Sweet Potato Fries and was so very impressed. I would honestly eat this over a regular burger any day! Next time, I want to try the vegan Mac and Cheese. Just. Yum. 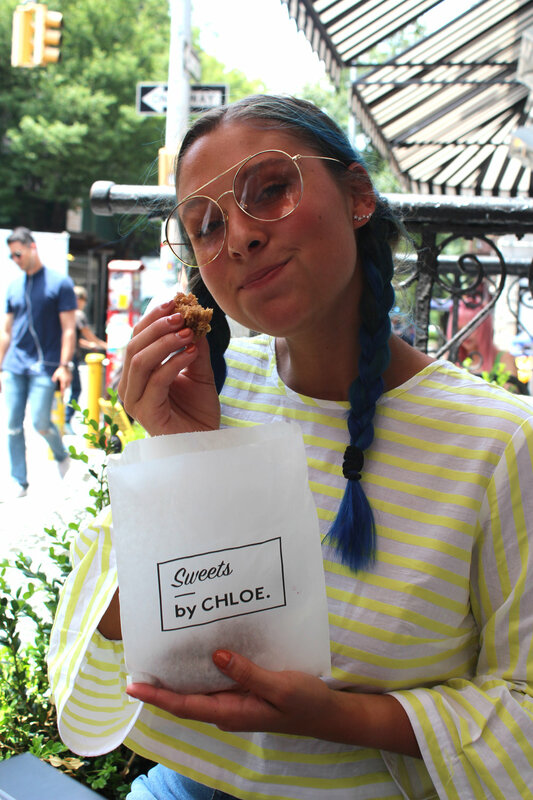 Also, right next door is Sweets by Chloe, which I'm sure you can guess, is where they sell vegan cupcakes, bakery items, ice cream, and more! This place, my friends, is definitely a must! The High Line is another go-to excursion when visiting NYC. Not only will you get some incredible views of the city & river, but also there's beautiful greenery, flowers, food vendors, and artwork displayed along the entire line! It used to be an old railway, so you can still see some of the train tracks as you walk along it which is pretty cool. 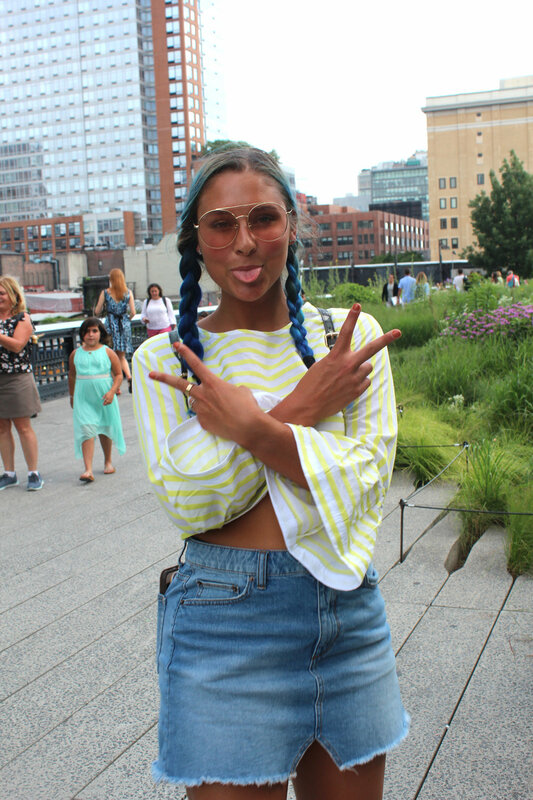 Something we love doing is walking the High Line towards the Village and either going to see the artwork at the Whitney Museum, or sitting at the Whitney's rooftop bar for some apps & drinks! And of course, it wouldn't be a Just Mands photo journal if I didn't share my outfit details! Can I just say, this top is usually something I would never be drawn to in the store, but for some reason I decided to buy it and I am very pleased with my purchase. It's such a perfect top for spicing up a casual Summer day! So, I always look forward to grabbing a pretzel from a street vendor in NYC because well, they're bomb. BUT this pretzel was seriously SO awful and stiff and I was just very sad. Thought I'd let you know. It was $5. Still mad about it! !